Dolby, Tom. “The Sixth Form”, Kensington Books, 2007. Tom Dolby is an amazing writer and he follows his first novel, “The Trouble Boy”, with the entertaining and thought provoking “The Sixth Form”. This time he leaves the world of gay Manhattan and takes us to another world, that of the New England boarding schools. “The Sixth Form” is a more personal book as Dolby himself was a student at one of them and he says that there are similarities between what he went through as he matured sexually. Written with great sensibility and insight we get to look behind the walls of the boarding school and the senior year of Ethan Whitley at Berkley Academy. Whitley left his unhappy home life in California and journeys to Connecticut where he meets and becomes friendly with another student, Todd Eldon, the son of wealthy New York parents. He also meets Hannah McClellan, an English teacher who has an enigmatic past. The three form a lasting friendship that is both destructive and supportive. 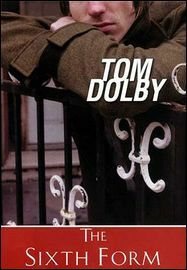 Tom Dolby looks at the adolescent heart as it deals with first love. Likewise he looks at the “world of privilege” and how it affects the adolescent mind. In fact, the book deals as much with class, status and money as it does with identity and sexuality. The differences among students are not just based upon knowledge and grades but upon where they fall socioeconomically. The tensions between classes among teenagers are a bit different because the trappings of social standing are not quite as visible as in the adult world. Dolby looks at kids who are raised in a world of privilege and shows some of the minuses to such a life that many of us do not consider—parents who are not always around, drug and alcohol usage, and growing up fast. The story is another coming-of-age saga but this time the two boys are very different. Ethan is shy and on a mission to find himself whereas Todd is wealthy with no affectations. As Ethan is introduced to the world of privilege by Todd and Hannah, he learns of a different way of life and the three begin to test their limits. This happens against the backdrop of Hannah’s past. As secrets come out. Ethan finds himself being pulled into the lives of his two friends and begins to find himself. Dolby writes with clarity and sincerity and a great deal of compassion and authority (as he should, having experienced prep school himself). When one’s life goes from innocence to experience, a great deal can and does happen. The sixth form is prep school parlance for the senior year and all of us can well remember the confusion we faced that year as we faced going out on our own, whether to college or to work. The characters of Ethan, Todd and Hannah are developed richly and Dolby allows us to enter their minds and try to understand why they act the way they do. Looking at adolescence through Tom Dolby’s eyes and words is looking at the human heart as it first comes to terms with love. Because Dolby himself (yes, he is that Dolby of audio fame) lived a life similar to that of which he writes, the novel blends fact with fiction and I found it to be one of the most important books I have read in a long time. It tugged at me while I read it and it is still tugging. Incidentally. Have a look at the author’s picture on the book jacket. Not only is he a fine writer but a good looker as well.